Getting stranded by a thunderstorm, a group of treasure hunters land on a deserted island in the middle of the ocean overrun by zombies from the colonial days along with other supernatural beings trapped there and must fight them off to escape. 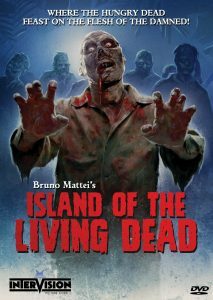 This here is one of the most enjoyable and entertaining Italian zombie films. What really gives this such a great deal to like is the old-school atmosphere here that recalls the epic feel and tone of the whole affair as a great throwback feel here. This starts from the very beginning as the opening scene of the Conquistadors confronting the afflicted natives down in the dungeon while the rabid voodoo ceremony brings them back to life is an absolutely spectacular start here that’s full of cheesy action along with the Gothic atmosphere, the later encounter in the cemetery is the epitome of cheesy action with the kung-fu attack following the initial stumbling encounter hidden from the others by the rolling fog and the big battle on the ship that blows up the whole thing which all form a solid opening that recall all the fun and enjoyment of the earlier Italian zombie films. Given that as well with the film’s other big action scenes here as the massive shootout that erupts when the group wanders into the swarm in the catacombs, the resurrection in the burial chamber below group or the group trapped in the various rooms full of gold with rotting skeletons, dead bodies being feasted upon and ravenous zombies breaking in through all manner of barricades offers some great action-packed moments that are a lot of fun. Still, even with all this the film really hits it’s stride with the wallowing in the cheesy realms Mattei usually works with, as there’s plenty of that kind of material here. From the fact that the film’s storyline allows it to feature numerous references and scenes throughout here that really stick out yet comes comes off as part of the charm with this one, as the graveyard attack is a carbon-copy of a legendary sequence, the entire plot is basically one long rip-off cobbled together from three other movies, a narration sequence for the backstory is taken directly from yet another film while there’s even several scenes here that rip off his own work from before. Even on top of that the nonsensical elements like the flamenco dancers, ranting and raving characters that are always in complete hysterics, unexplained plot lines like the friendly, talking ghosts explaining everything and the cheap charm all on display here which adds to the fun and delirium of a Mattei effort. Along with the stomach-churning gore and fine, mess make-up work for the zombies, these here all manage to make this one of the best of the Italian zombie films. About the only flaw here is in how this one deals with these elements which may not be suited for everyone who don’t appreciate or are distracted by such material in a film.